The concept of Content Personalization is to show a customized message to the right person with the hypothesis that this will lead to higher revenue/engagement/[Insert KPI here]. The idea is solid and has been proven out at small scale but very few, if any, organizations are successfully executing. As marketers, we've bought the DMPs, CRMs, A/B Testing Tools, and Marketing Automation platforms so why can't we fully execute? The primary reason is because it's really hard to execute many worthwhile tests/campaigns in parallel and even harder to maintain all of your test winners going forward. Every experienced website optimization team adds segments to each A/B test they run to see if different segments behave differently. You start with one website that everyone sees, "A". 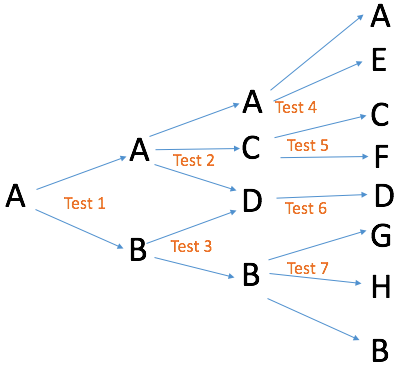 You run an A/B test and find Segment1 responds well to version "B" but everyone else likes "A" so you push version "B" to Segment1 permanently because it performs better. As you iterate and test more and more you end up with something that looks like the above illustration, probably even worse. Clearly this is not scalable and at a certain point, you simply don't have enough resources to maintain all the different content you need to make every segment happy. How do you full-scale the results after you've run 10 tests? 1 year's worth? 5 years' worth? How do you support all this through site redesigns, creative updates, changes in brand standards, not to mention support responsive layouts and multiple device resolutions? Frankly, it's impossible. There is no way you can keep up with the amount of content that is needed. So even if you want to have a personalized site, you're very limited in what can actually be done due a limited amount of content creation/management resources. This, the content dilemma, has been the elephant in the room that most ignore in the website optimization community. It's because the content side of the equation has been essentially ignored. Personalization = Right Message/Content + Right Person. DMPs and CRMs can help identify the right person but we're still missing half of what we need to successfully execute - the content. "We'll just pass it off to the creative team." Famous last words before a campaign gets sentenced to purgatory. I've heard this said more times than I can count. And don't get me wrong, it's not the creative team's fault, they only have so many resources available and a lot on their plates. It's the optimization team's fault for thinking this is a viable strategy and doing a poor job of picking campaigns that are actually executable. Let's take a look at the reality of the current situation. 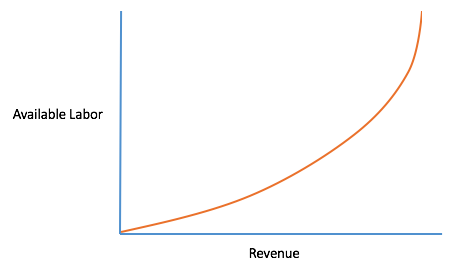 Here I'm plotting Revenue (or whatever your KPI you're measuring) vs Effort. 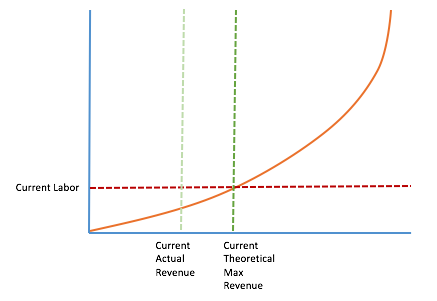 Current Theoretical Max Revenue is where you'd be if you were spending your all your time only on those things which offer the most return for the input. In reality, you're somewhere well below that (Current Actual Revenue). 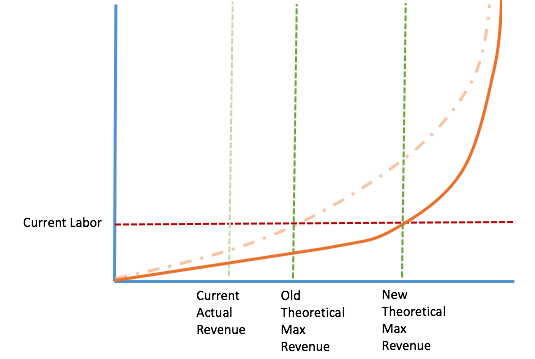 Addressing this gap and moving the Actual Revenue closer to the Current Theoretical Max is exactly why A/B testing tools were invented in the first place. The problem is we oftentimes bite off more than we can chew and choose tests that are not only difficult to execute, but would be impossible to full-scale if the alternate experience won. We invest in "personalization" tools which really only offer data and content delivery but no real way of actually building the required content. These tools then go underutilized. So personalization isn't possible? What a total bummer, huh? 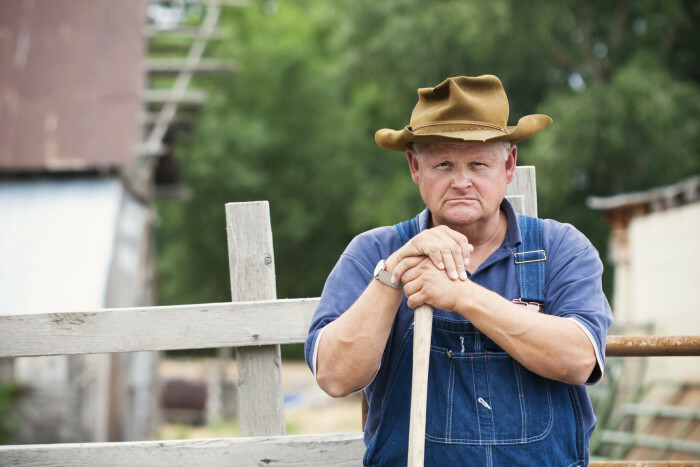 Things aren't so dire, you actually can do all of this, you just need to be like a farmer. The year is 1800 and you are a farmer. You have an acre of land and while you're not wealthy you're doing just fine. Then a salesman finds you on LinkedIn and sends you a really good pitch on a 10-acre plot. It's expensive but look at the ROI! It's hard to argue with his numbers, this will be great for your farming career. So you buy the 10 acres and eagerly await the next planting season. Spring of 1801 comes and you start plowing your newly expanded fields. Pretty soon you realize it'll be harvest before you get all this land plowed, you just simply don't have enough labor available to farm 11 acres. You can hire more people but you're just a farmer, you don't have the budget and don't know any venture capitalists investing in farms right now. What you really need is a way to increase your productivity. Farmers are not simply moving the Current Actual Revenue closer to the Current Theoretical Max Revenue(output). If this were the case we'd expect output increases to tail off over time. 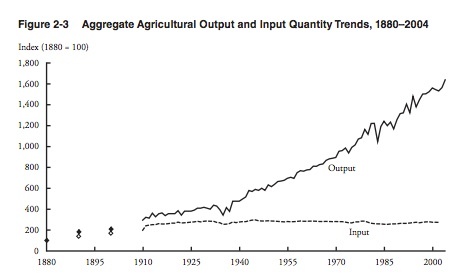 Instead, we see a steady linear, or perhaps even exponential increase in output. What farmers are actually doing is moving their Current Theoretical Max Revenue(output) further to the right in addition to becoming more efficient in general. So how can we be more like farmers? Well, we need machines that allow us to "farm more acres", or in other words, we need to find and adopt innovative advances in technology to help us remove the limitations of manually creating and managing content for micro-segments and individual people. See this previous blog post for a more detailed explanation of these capabilities and a detailed example.